The invasion of weeds is arguably one of the most obvious and serious threats to the environmental values of The Pinnacle. The consequences include the elimination of native grass species and the destruction of habitat that native birds and animals use for shelter, food and nesting. Weeds also alter bushfire pattern and intensity, and contribute to loss of plant cover and soil disturbance. If you walk through the park in late spring or early summer you could suddenly be in a forest of vicious saffron thistles, or surrounded by the bright yellow flowers of St. John's Wort. You will walk through a virtual sea of sorrel and exotic grasses. The good news is that, thanks to the efforts of our volunteers, the worst weeds are much less prevalent now than they used to be and small native plants and grasses are slowly making a comeback. Continued vigilance is required to consolidate and extend these gains and make the Reserve an area where native plants are more visible than the weeds. A weed can be an exotic or native species that colonises and persists in an ecosystem in which it did not previously exist. Weeds range in size from small herbs (e.g. Paterson's Curse, Verbascum sp.) and grasses to shrubs (e.g. Briar Rose, Cotoneaster sp.) and trees (e.g. Chinese Pistachio). Spraying. Our main form of weed control (60% of our effort in most seasons) is spraying with herbicides. We predominantly use selective broadleaf herbicides targeted to specific weed groups to minimise the possibility of affecting native plants. The ParkCare Volunteer Policy requires all sprayers to be Chemcert accredited, and funds are available for that. We spray St. John's Wort, African Lovegrass, Paterson's Curse, Verbascum, Thistles, Capeweed, Briars and Blackberry when conditions are appropriate in spring, summer and autumn. Weekly weeding parties tackle weeds by chipping (hoeing), pulling and, when necessary, bagging flower and seed heads. Weather permitting, weeding teams patrol the Reserve on Thursday and Saturday mornings most weeks. Slashing. An effective method to control Saffron Thistle (and some other weeds) is slashing just prior to seed setting. We use both brushcutters and scythes, as appropriate. Slashing mainly occurs in late Spring. 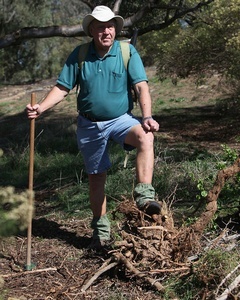 Prior to using a brushcutter or scythe on The Pinnacle, volunteers are required to receive brief training from ACT Parks and Conservation Service for Health and Safety purposes; this is arranged by fotpin. The activities of weeding teams are advertised in This Week on The Pinnacle. Thisis a highly invasive clump-forming warm season grass that has recently been located along Cotter Road near Camp Cottermouth. Report any other sightings to Citizen Science websites/apps like Canberra Nature Map http://canberra.naturemapr.org/ with a close up photograph. This is a highly invasive drought, fire and herbicide tolerant weed that can invade undisturbed natural ecosystems. Coolatai Grass has not been detected in the ACT but infestations are present to the north and south in NSW. Following a systematic weed survey conducted in Spring 2009, fotpin compiled a 10 year Community Weed Management Plan for The Pinnacle Nature Reserve [ 1.2 MB], a draft of which was released for community comment in May 2010. The draft Plan proposed a goal and objectives for managing weeds at The Pinnacle Nature Reserve. It identified priority weeds and management principles, treatments, spatial priorities and continuous improvement strategies for weed control. The Plan estimated the effort required to achieve the Plan's performance targets, and compared that to weeding effort at the time on a seasonal basis. Priority weeds for control, identified on the basis of the 2009 survey (see sections 3 and 4.1 of the Plan), included: African Love Grass; St. John's Wort; Blackberry and a range of woody weeds (including briar rose, cotoneaster and privet); Saffron, Nodding and Scotch Thistle; Horehound; Verbascum spp; Paterson's Curse; Sorrel; and Capeweed. Control treatments depend on the weed species and season, and include spraying with herbicides, slashing, grubbing, and (for shrubs and trees) cutting and dabbing with herbicide. Significantly, as well as tackling the weeds, the Plan dealt with the challenge of increasing and improving the area and condition of native grasses across the reserve. It was proposed to slash large areas of exotic grasses prior to seed set, so that later seeding native grasses can out-compete exotic grasses and gradually recolonise slashed areas. This strategy was complemented with an experimental approach to directly restoring native grasses by sequentially burning, slashing, harvesting a crop plant and soil treatment - see Defeating the Weed Menace (now completed). A monitoring and reporting program was included in the Plan in order to to maximise the efficiency and effectiveness of its implementation (see section 5 of the Plan). The Plan concluded that the major barrier to weed management is trained volunteer time and effort. This is therefore a prime target for fotpin activity. It was estimated, without including time for monitoring and reporting, that achieving the Plan's performance targets would initially require 1,182 hours per year, distributed across autumn (135 hours), winter (132), spring (447) and summer (468). Aspects of the The Weed Plan are still evident in our current weed control activities, but the plan itself was superceded to some extent after a few years by its successful implementation, with many of the original target weeds no longer a problem. In the first 6 years that the plan was in operation (2010 to 2016) an average of 924 hours per year was spent on weed control on the Reserve. This is less than the amount projected in the plan, partly because of the difficulty of making accurate predictions, partly because of improvements in our control approach and partly because within that 6 years there was already evidence of a reduction in prevalence of a number of weed types. Changing weather from year to year also influences the effort required. Our efforts also expanded beyond the Reserve to include the bordering paddocks of North Kama and Bottom Pinnacle (see the location map), primarily to provide buffering against weed infestation of the Reserve from those quarters. When the effort spent in those areas is included the average over the first 6 years was 1169 hours per year.